‘More than words are needed to save civilians’, the mayor of east Aleppo said as he arrived in Brussels to address the EU summit. 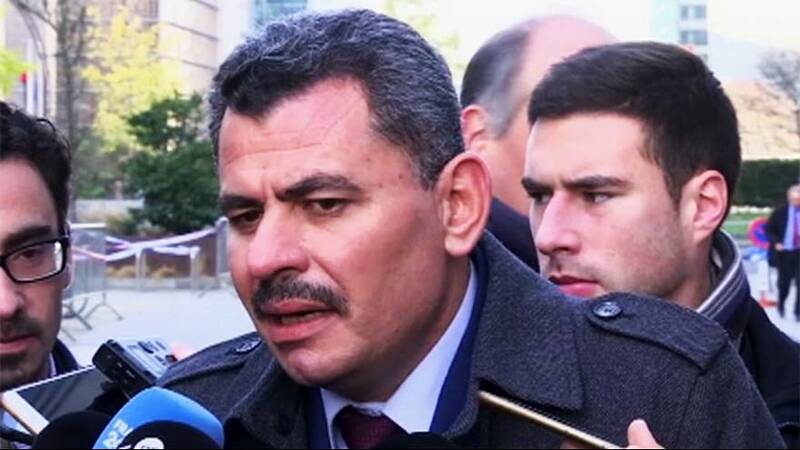 Brita Hagi Hasan (president of the East Aleppo local council) wants European countries to send monitors to ensure thousands of residents trying to flee the besieged Syrian city make it out safely. Speaking to reporters outside the Council building, he issued a stark warning saying that 50,000 civilians ‘are about to be victims of a general massacre. “Tomorrow is too late for Aleppo. We need a solution today from the European Union,” he said. Ahead of the summit he met with EU Council President Donald Tusk who invited him to address European leaders. EU leaders were discussing the situation in Syria, though are unlikely to issue new sanctions on Russia over the violence in Aleppo. Arriving at the summit, French President Francois Hollande said he wanted EU leaders to issue a call for a ceasefire to allow the civilians and wounded to be evacuated. In a sign of solidarity with the people of Aleppo, the Grand Place in the Belgian capital will turn off its festive lights between 7pm-7.30pm local time. It follows on from the French capital which turned off the lights on the iconic Eiffel Tour for the people of Aleppo on Wednesday. It comes from a citizens’ initiative and was supported by the Brussels council.